Flow cytometric analysis of human whole blood using Arginase-1 (D4E3M™) XP® Rabbit mAb (PE Conjugate) (solid line) compared to concentration-matched Rabbit (DA1E) mAb IgG XP® Isotype Control (PE Conjugate) #5742 (dashed line). Analysis was performed on cells in the granulocyte gate. 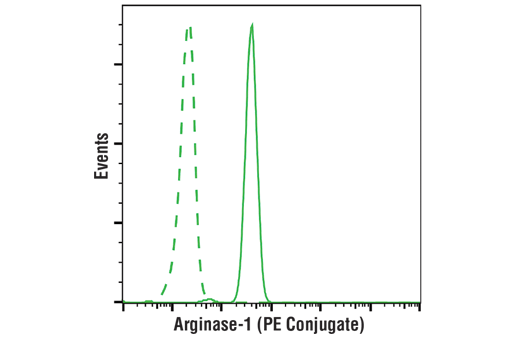 Arginase-1 (D4E3M™) XP® Rabbit mAb (PE Conjugate) recognizes endogenous levels of total arginase-1 protein. This antibody does not cross-react with arginase-2. Monoclonal antibody is produced by immunizing animals with a synthetic peptide corresponding to residues surrounding Val47 of human arginase-1 protein. This Cell Signaling Technology antibody is conjugated to phycoerythrin (PE) and tested in-house for direct flow cytometric analysis in human cells. This antibody is expected to exhibit the same species cross-reactivity as the unconjugated Arginase-1 (D4E3M™) XP® Rabbit mAb #93668. Arginase-2 is a mitochondrial enzyme that catalyzes the hydrolysis of L-arginine to L-ornithine and urea (1). Research studies have shown that in acute myeloid leukemia (AML) patients, arginase-2 is released from AML blasts to the plasma, leading to the suppression of T-cell proliferation (2). It was also shown that arginase-2 is required for the immunosuppressive properties of neonatal CD71(+) erythroid cells, which inhibits neonatal host defense against infection (3). In addition, the expression of arginase-2 in dendritic cells is repressed by microRNA-155 during maturation (4). This repression is essential for T-cell activation and response (4). Lee, E.J. et al. (2013) Mol Cells 35, 396-401. Mussai, F. et al. (2013) Blood 122, 749-58. Elahi, S. et al. (2013) Nature 504, 158-62. Dunand-Sauthier, I. et al. (2014) J Immunol 193, 1690-700.